The intention is merely to give a brief overview of the role of hypothalamic areas which are known (at this point in time!) to be involved with energy balance, and their interaction with peptides produced in other areas of the body. 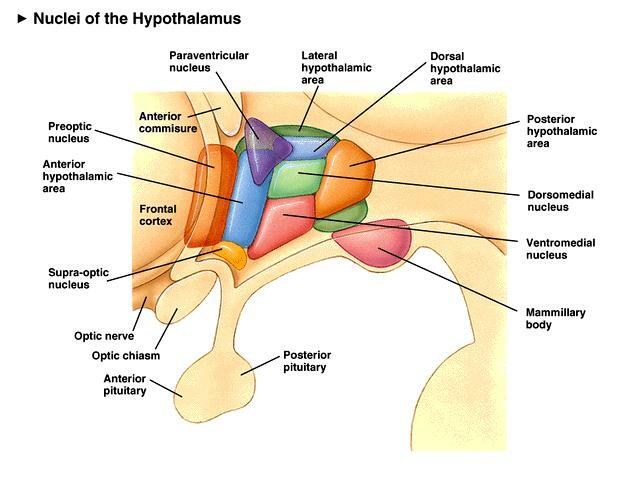 The Hypothalamus and the Dorsal Vagal complex together are involved in the regulation of appetite and hence the fat mass. While the Lateral Hypothalamic nucleus along with the peri-fornical area is implicated in positive energy balance (increased appetite), Brain Res. 1993 Dec 10;630(1-2):41-9 the paraventricular (PVN), dorsomedian (DMN), and paramedian (PMN) nuclei are involved in circuitry that decrease appetite. Signalling between these two different sets of nuclei are integrated by the Arcuate nucleus of the hypothalamus. The Arcuate nucleus is conveniently located at the floor of the third ventricle in an area without the blood brain barrier. This facilitates signalling from the peripheries (intestines and adipose tissue) to reach the relevant nuclei via the Arcuate nucleus. The Arcuate nucleus produces neuropeptides which are either orexigenic (appetite promoting) or anorexigenic (appetite decreasing). Neuropeptide Y (NPY) and Agouti Related Peptide (AgRP) work together as orexigenic peptides, while alpha MSH (α Melanocyte stimulating hormone) and Cocaine Amphetamine related Transcript (CART) function as anorexigenic peptides. Other peptides favouring an orexigenic ( Orexins, Galanin, Cannabinoids, Melanocyte concentrating hormone-MCH) or anorexigenic (Neurotensin, Urocortin/CRH, Serotonin, Cholecystokinin) behaviour are also produced or present in the hypothalamic nuclei. Peripheral signals from the gut may act on the NPY/AgRP pathway (Ghrelin) to facilitate energy intake, while other gut hormones (Peptide YY, Cholecystokinin, GLP-1, Oxyntomodulin) act on the Arcuate nucleus to facilitate a reduction in energy intake. Peptides from the adipose tissue (Leptin) influence both orexigenic and anorexigenic peptides depending on the body (fat) composition or energy state to bring about alterations in behaviour to maintain fat mass, predominantly concerned with ensuring adequate fat stores. While these networks in the hypothalamus are being increasingly clarified, the importance of the brainstem areas in appetite regulation is also being recognised. POMC immunoreactivity (melanocortin system) has been described in the nucleus of tractus solitarius and other nuclei, and they communicate with the hypothalamic melanocortin system to bring about appetite modulation. Thus, while the predominant concept is that the Arcuate nucleus by virtue of its lack of blood brain barrier receives and relays signals from the peripheral organs, the vagal nuclei also facilitate communication between the peripheries and the hypothalamic nuclei. The Dorsal Vagal complex consist of the nucleus of tractus solitarius (NTS), Dorsal Motor nucleus of Vagus (DMV) and area postrema (AP). Vagal afferents carry primary sensory information from the gastrointestinal tract to the neurons in the NTS and AP. The NTS processes these sensory inputs and sends axonal projections to the subjacent DMN. Vagal efferents from the DMN project to enteric neurons in the gastrointestinal tract and pancreas effecting a variety of gastrointestinal actions modulating gastric emptying, gastric motility and pancreatic secretions. Interruption of vagal transmission (surgically or pharmacologically) has been shown to result in blockade of the actions of peripherally injected peptides, suggesting the role of the vagus in mediating the central transport of peripherally produced impulses. The dorsomedial region of the NTS has fenestrated capillaries that allow circulating peptides to access the NTS and neighbouring DMN, further facilitating communication between the gut and brain. Thus, while some hypothalamic nuclei sense and relay energy status, other nuclei send signals to initiate appetite. But motor activity need to be initiated to respond to this appetite with resultant food procurement. Food stimulates dopamine release in the nucleus accumbens from neurons that project from the ventromedial nucleus to the nucleus accumbens. This dopamine release in the nucleus accumbens is thought to play a role in behavioural modification with motor responses that aim to facilitate appetite quenching through quest for food and food ingestion. Brain Res Brain Res Rev. 1999 Dec;31(1):6-41. The Nucleus Accumbens contains a high density of CB1 (Cannabinoid receptor-1) receptors, through which endogenous cannabinoids may influence feeding related activity. The central nucleus of amygdala is being increasingly recognised to be important in ingestive responses. Direct projections from the nucleus of amygdala to the PVN have been described, as well as connections with the Nucleus of tractus solitarius and DMV (dorsal motor nucleus of vagus). J Comp Neurol. 1984 Mar 20;224(1):1-24. Activation of the hypothalamo-pituitary-adrenal axis and the Growth hormone-IGF-1 axis induce a positive energy balance while the hypothalamo-pituitary-thyroid axis activation produces negative energy balance through increased BMR. The PVN is sensitive to the actions of glucocorticoids secreted by the adrenal cortex, Diabetes. 1999 Feb;48(2):365-70. and it may effectively function in conjunction with the hypothalamo-pituitary-adrenal axis. The hypothalamo-pituitary-ovarian axis induces a negative energy balance in women.